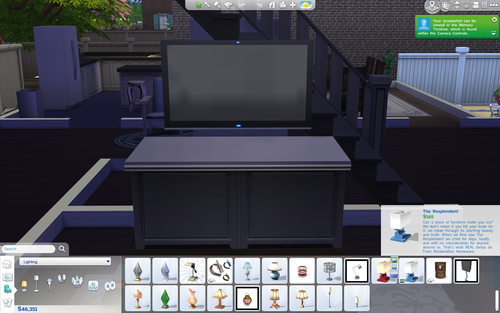 Mod The Sims - Sims 4 Studio Updated Beta (Version 2.4.1.9) 05/04/15 XML EXTRACTING! Sims 4 Studio Updated Beta (Version 2.4.1.9) 05/04/15 XML EXTRACTING! Replies: 39 (Who? ), Viewed: 31064 times. Extract tuning from all available EA combined tuning resources and string tables simultaneously (all EP/GP/FP tuning is extracted at once). You can choose to extract only the tuning instance you're working with instead of waiting while they're all extracted. Combined tunings can be auto-loaded rather than having to browse every time. You can create subfolders in the browse location. You can edit the .xml/tuning resource in Studio's .xml editor and it has syntax highlighting. Alternatively you can export the .xml resource for editing in your preferred editor and then import it back in. The extracted tuning file retains references to the original tuning file in the form of comments (so that they're optional). This feature is designed to allow modders the choice of whether or not to override a particular tunable element in the hopes that tuning mods made using it will be more patch-compatible. Studio comes with a hex-dec converter and with a hasher that has hex and decimal options. It also has a check box for the high bit. #2 7th Oct 2014 at 9:45 PM Last edited by Bakie : 7th Oct 2014 at 9:57 PM. I think it's great to have the opportunity with Sims Studio to make StandAlone packages! But I was wondering why not all kind of clothing is avaible in Sims Studio to make into a (StandAlone) package. For example, I can't find the Female black, and the female white Crew Tshirts? They do excist, because I found them when searching for them in ColorMagic. Is this some kind of bug, or am I not searching very well? Hope someone can help me find them! I still had the older version Sims4Studio_v1.085 on my PC too and checked for the Black and White crew Tshirts and there they do appear! @ Bakie - Thanks for your response! Would it be possible to go to the bug thread on the forum HERE for the tool and post that? i tried to install it but it said the installation was interrupted and to restart the installer every time i try to install. Blender vertex groups will always be preserved from the original item. Additional groups are now added to the end. We would like to hear feedback from anyone that was getting the error exporting meshes that had non-English characters in their user name before this version. I have tested by making another Windows account, but I'd like to be sure that it is fixed for everyone. Also, the added CAS Parts from the patch such as the Star Wars items and new eye colors do not have a thumbnail. You can still find them by searching and moving the cursor over the default thumbnail (red x) to see their names. I'm not sure where EA is putting them or if they are generating them in the game and caching them. If anyone knows more, we'd love to hear from you. A wall tutorial will be posted shortly. We have received several inquiries regarding objects. The team has been working on them for a little over a week now. While progress has been made, we aren't ready to release that, but we hope that it will be ready soon. 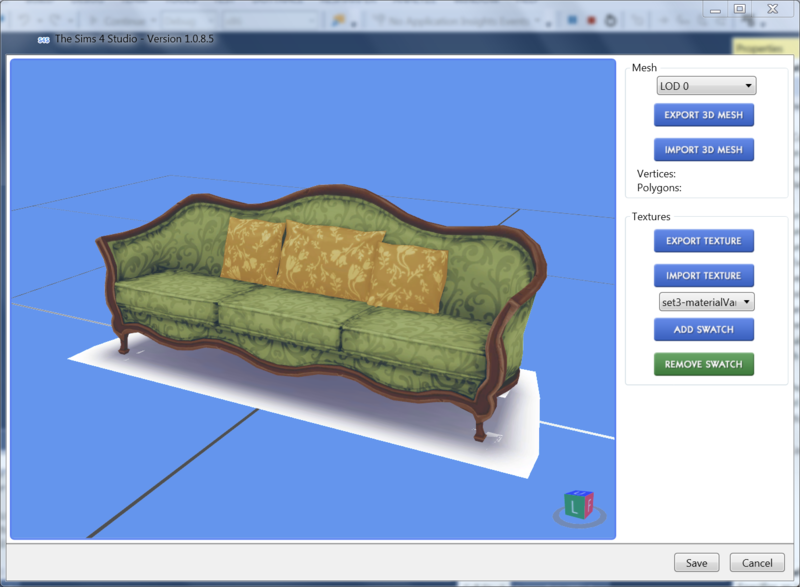 We have objects in the model viewer and in the game, but there are many important issues that need to be ironed out before this feature is ready. Hotfix available for walls. This should fix the issue where people that use a non-English version of the game see *DEBUG* instead of the catalog name/description. If you made a wall with the previous version, just open it in the new one and save your package again to fix it. You should NOT need to re-clone. If you had this problem, please let us know if this version fixes it. There is another hotfix available for walls. This should fix an issue where custom wall textures were conflicting with the original EA clone. To fix a wall package that you have previously made, simply open it in the new version of S4S and save the package again. There is a new update to the preview version. This adds the hotfixes to the walls from the stable version as well as cloning more textures for walls. We are currently in the process of separating the stable and preview test versions. Version 1.0.9.8 has reversed some unstable changes that were not meant to be in the stable version. There is a new update to the perview version. The 7z file has been updated with the new and the MSI will follow within the next 24 hours. We are looking to do our final push of fixes for the preview version this weekend so that we can release a stable version of it to the community on Sunday, 10/26. Please be sure to submit any bugs that you have as soon as possible! Thanks again for all of your hard testing! The preview version has now been released as stable with a few extra enhancements! Updated for the pools patch Preview Version 1.5.4.1 11/04/14! 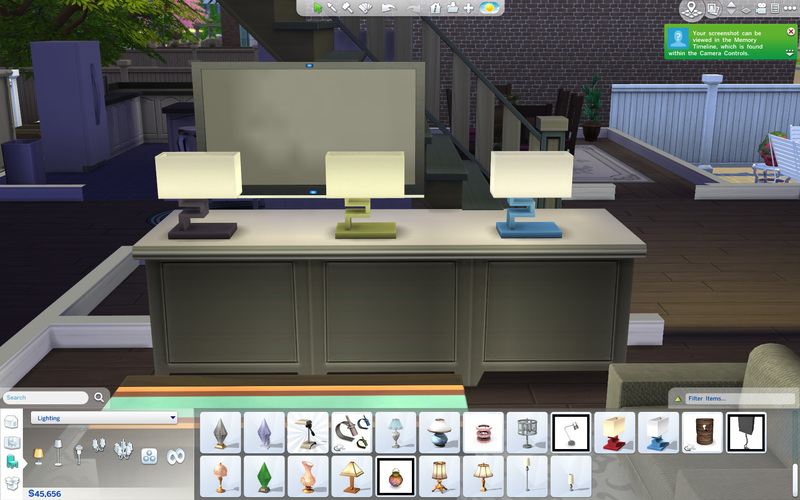 Items added in patches won't have thumbnails in Sims 4 Studio until you have loaded your game and looked at it in game. Clearing your thumbnail cache will also clear them from Sims 4 Studio. Updated for the November pools patch to Stable (Version 1.5.6.0) 11/08/14! Fixed a bug that prevented the license and readme files from being included in the zip and installer. #21 14th Dec 2014 at 1:19 AM Last edited by melbrewer367 : 14th Dec 2014 at 2:54 AM. The objects you recolor will NOT override the game files. You can still only have as many swatches as the original item but it will NOT override the original. I have already recolored an object to test it. It creates a separate thumbnail. Edit: Probably better stated as, it creates a clone. So now the item is there twice. Side note: I'll be updating all my previously uploaded objects with this so that they'll no longer override the base game objects. #22 14th Dec 2014 at 1:37 AM Last edited by plasticbox : 14th Dec 2014 at 2:58 AM. What do you mean by "have as many swatches as the original item"? Your screenshot shows up very small, so I can't quite see on that what is what .. maybe you can attach it to your post? That way one could enlarge it. #23 14th Dec 2014 at 1:55 AM Last edited by CmarNYC : 14th Dec 2014 at 12:53 PM. What Plasticbox said. Getting there first doesn't necessarily mean anything, and once the new TSRW is out it'll be interesting to see the strengths and weaknesses of each tool. Edit: This was in response to a remark that was later removed. I'm so pleased to hear the new recolor feature is working for you melbrewer367. Sims 4 Studio doesn't engage in any closed creator testing. What is done before a beta is put out is testing to be sure the new features won't create content that will crash someone's game and that they, in general, function to do what they're supposed to do. No one wants to download a tool that says it can make a recolor only to find the export image button doesn't work This is why you don't see a bunch of content made with new Sims 4 Studio features prior to the release of the new tool. The tests for safety and general functionality usually take about a day or two once the code has been designed. For this reason it is undeniably true that Sims 4 Studio beta (aka Preview) versions have bugs that need to be fixed before that version can be considered a "stable" community tested version. This makes the tool very dependent on community feedback. All reports, positive or negative, regarding bugs or opinions on function, are appreciated.Fortunately, many people have helped with the beta testing and all the beta tests are completely open. If someone wants to try Sims 4 Studio they don't even need to join the forum. I agree that getting there first doesn't mean anything (Studio hasn't been first to anything ). It's really all about making a good tool that creators can use to create content with that doesn't lead to hair-pulling frustration. #25 14th Dec 2014 at 2:52 AM Last edited by melbrewer367 : 14th Dec 2014 at 3:03 AM. Yea, you got it in the edit. It's like there's two of that lamp now. Attaching image now. So, since that lamp has three swatches in the original I was only able to make three recolors. However, it didn't override anymore so now I actually have 6 color options. Or like with the baby beds I had recolored. I had three packages each with the 4 swatches but you could only use one and have 4 color options. Now I've made new packages with them using s4s and now people can put all three of my baby bed packages into their game and have 16 color options but in the catalog they'll see 4 baby beds they can choose between that each have 4 swatches. It says in the notes that they're working on adding the ability to add more swatches though. So technically, we'll end up having to update the recolors one more time to put them in one catalog item later. ETA: Oh and this does have the same issue as the new objects with changing the color in game. When you try to use the color changing tool you get that Script Call Error so you still have to pick the right color ahead of time or sell it and then change it. It automatically creates the thumbnails though so you can see the item before you pick it and of course the swatches are editable so they match up as well.